Our original plan after bringing our trailer home was to park it in a friend’s storage yard and get it back out over the weekend of September 15th and camp at Fort Toulouse. We drove over to the campground on Sunday evening, the 9th, to check out the campground. After a few minutes of debate, we just decided to park the trailer at Fort Toulouse on Monday the 10th through Friday the 21st. We’re supposed to fly out west to see our newest granddaughter on the 22nd and will be gone two weeks. I drove the truck and trailer to work on Monday the 10th, giving a few co-workers the tour of the unit out in the parking lot. At lunch, Val drove down and met me and we drove the truck and trailer over to Ft. Toulouse. Nobody was in the office to check in, so we took a chance and found a nice riverfront spot and set the trailer up. We headed back over to the office and paid for 11 days. We also inquired about long-term parking there and found out that may be a possibility. We wanted to actually use the trailer instead of storing it, so that would work out great if we can. Monday evening, we took some clothes and such out to the trailer to spend the night in it. Mike and Kelly Barnett, fellow Heartland owners, came over to introduce themselves and encourage us to join the Heartland Owners Club, which we intend to do. Had a nice chat with them that evening before heading into the trailer to sort out clothes and groceries. Tuesday and Wednesday evenings we spent at our house, though Val went out to spend the day at the trailer. We brought over all kinds of clothes and food to spend Thursday through Sunday nights out at the trailer. As I write this on Sunday evening, we’ve just brought back enough clothing and food to spend the rest of the week in the trailer. We’ll have to work on setting up long term towards the end of the week and, as we’re flying out very early Saturday morning, we’ll definitely be sleeping at the house Friday night. 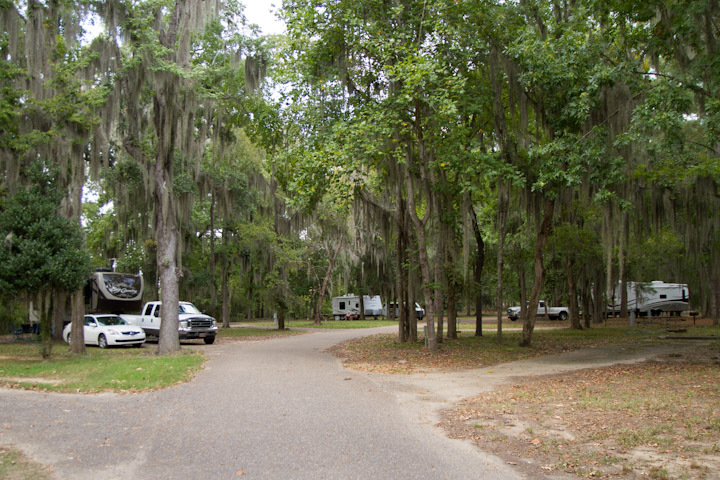 We love the Fort Toulouse campground. It’s so peaceful and quiet. The trees are dripping in spanish moss. The regulars are certain to stop by and say “Hi” when you are outside. Plus, we’ve enjoyed the company of Mike and Kelly a couple nights this weekend. Sadly, they’re pulling out tomorrow (Monday), but I’m sure we’ll run across them again. We’re all Facebook friends now and Val has shared phone numbers with them, so we can stay in touch.